The AIK Ltd., known as 'The Institute', is a democratic and open organization that has been developed to represent Kinesiology and service Kinesiologists and Kinesiology practitioners throughout Australia. Having been established in 1998, `The Institute' is represented nationally with having members in every state across Australia. Safeguarding the interest of Kinesiology and Kinesiology practitioners throughout Australia. 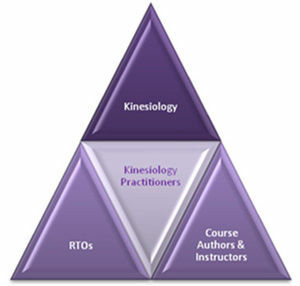 The following triangle is a simple diagram showing how Kinesiology is supported by members of The Institute, Registered Training Organisations (RTOs) and course authors and instructors registered with The Institute. All of us play a part in ensuring that this fascinating and life changing field grows into one of the main health modalities in Australia today. Feel free to explore our website, learn more about Kinesiology and what it can do for you and even find a kinesiologist in your area. If you have any further questions please contact us by CLICKING HERE.